A social enterprise cafe, under new management by the charity Yellow Submarine, was officially opened today by David Cameron, Prime Minister and Witney MP. The cafe, based at the Windrush Leisure Centre, has had a complete makeover with new decor, new furniture and a revamped serving counter; an improved menu includes homemade food and barista-served coffee. Yellow Submarine provides opportunities for young people with learning disabilities in Oxfordshire and the cafe will be run by some of the adults that it works with, giving them the opportunity to gain valuable work experience and new skills. The charity already operates a successful cafe and hub in Park End Street in Oxford and has been shortlisted as Oxfordshire Cafe of the Year. David Cameron said: "Yellow Submarine is an inspirational charity and I have seen first-hand the difference they make in Oxfordshire. Their apprenticeships and employment opportunities give young people with learning disabilities the skills and confidence to make independent decisions. 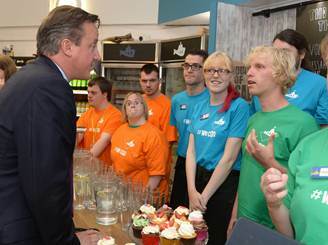 So many of us take this for granted and it was a pleasure to open their new cafe in Witney." Pictured with David Cameron from left to right are: Anthony Langdon, Sarah Clarke, Tommy Lovegrove-Owen, Shane Butler, Katy Cocking and Gergo Zakonyi. Toby Staveley, Manager of Yellow Submarine, said: "This is much more than a new cafe. It's a centre for employment, training and social activities for people with learning disabilities. It's a place where parents with disabled children can drop-in for advice. It's a timely and innovative solution to supporting the most vulnerable in an affordable and sustainable manner." The project is in conjunction with West Oxfordshire District Council, which owns the leisure centre, and GLL, the leisure contractor that manages the centre on the Council's behalf. The District Council has enabled the project by funding over ?30k towards the kitchen and service counter renovations. Cllr James Mills, the District Council's Cabinet Member for Leisure and Health, said: "This is an exciting new venture and we are so pleased to be welcoming Yellow Submarine to Witney. The charity does outstanding work with young people and their Oxford cafe has one of the highest ratings in the city; all in all, it's a win-win situation for everyone." Mark Sesnan, GLL Managing Director said: "As a 'not for profit' social enterprise GLL is delighted to be working with Yellow Submarine another award winning charitable organisation on this fantastic initiative. The scheme will both enhance the service at the Windrush Leisure Centre and help young adults with learning disabilities in Oxfordshire build their confidence and independence." Yellow Submarine has benefitted from funding towards this project from Oxfordshire Community Foundation's Future-Building Fund, Oxford Social Enterprise Partnership and NatWest.